The Three Owls Bird Sanctuary and Reserve was founded in 1962 when a young girl called Helen took a baby Sparrow to Mrs Eileen Watkinson. She reared this and the following week the little girl brought another "A friend for the first" Little did Mrs Watkinson realise, but from this small beginning would grow a Sanctuary which now has Supporters world-wide. 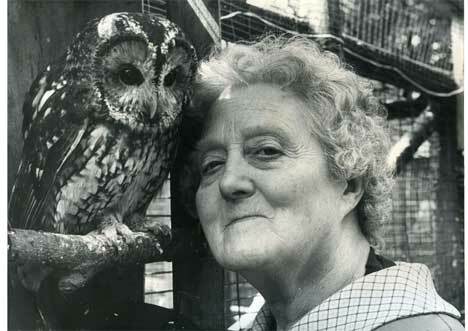 In 1991 she was awarded the MBE for her work with the birds - something she openly shared with all the helpers at the Sanctuary. 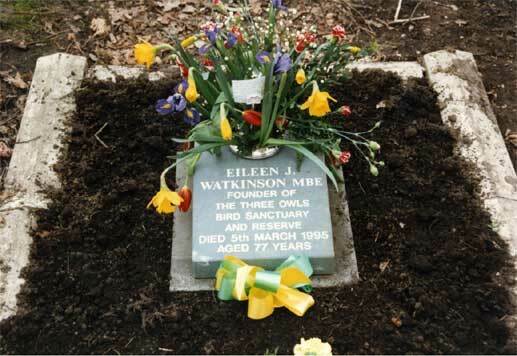 Sadly Mrs Watkinson passed away in March 1995 following a long illness. She is buried on the Reserve in line with her wishes amongst all the birds she loved and cared for over the years. The work at the Sanctuary was taken over by Nigel Fowler, who had worked on a one to one basis with her since 1978 and was the only person prepared to take on the 24 hour day, seven-day week task which running the Sanctuary entailed. He was awarded the much coveted ''Volunteer of the Year Award'' in June 2000 for his work at the Sanctuary. The Sanctuary is both a Registered Charity and Charitable Trust. The aims of the Sanctuary were to take in any wild bird in distress, to rehabilitate it and return it to the wild. Where this is not possible, due to illness or injury, but the bird was capable of sustaining a good quality of life, we offered it sanctuary in one of our many aviaries or on our 4½ acre Reserve. Sadly, the hospital and aviary facilities closed down in 2010, when the amount of red tape and legislation being brought against it, coupled with a year-on-year battle to raise the £10,000 per month it needed to keep going finally became to much to keep battling against. It was during 2010 that the resident birds were re-housed in other sanctuaries throughout the UK, and the facilities Three Owls had built up over the years, were distributed to other needy bird welfare charities in order to give wild birds in distress elsewhere in the UK, a better chance of survival, just as they had been when treated here at our Sanctuary. It is not only owls that were a large feature of the Sanctuary. Two disabled herons were brought to us in 1981 having both been in collision with pylon wires Their injuries were so severe that they each were left with only one 'good' wing each. In 1985 they paired up, being unable to fly, they built a nest on the ground. Three babies were reared and these then flew away when fledged. They returned the following year with wild 'friends' and built nests on the aviary roofs. The following year they then progressed into the trees in the Reserve. Each year the babies from previous years have returned to nest, and by 1993 we were told we have the largest Heronry in the Northwest. Numbers have since fallen as we expect the surrounding food stocks have also diminished. It is worth pointing out that this instance would not have occurred, had we not given the disabled herons a chance to live their lives out at the Sanctuary. In 2000, our derelict Grade II Listed Barn was converted into a 3-bed cottage, which is rented out to provide a sustained income for the Sanctuary. Since 2010 we have been busy helping wild birds in other ways. We still have the 3 acre nature reserve at Rochdale – which is home to a multitude of different wild birds and animals. The office is still based in the same building, and so our mailing address remains the same. Following the sale of the buildings and the top acre of land, we were able to purchase a 7.5 acre plot of Grade 1 agricultural land at Tarleton near Southport. This was the culmination of months of searching and meetings by our trustees. This new plot of land – already important to Three Owls as a bird release area – is where we are planting out the new “Three Owls Wood”. Since then we have acquired two 2-acre reserves; the Field Reserve at Wigton, which as it's name suggests, is a large field bordered by hedging and alongside Knoxwood Wildlife Rescue with whom we work closely with. This provides not only a great release site for rehabilitated birds, but also encourages insects and butterflies, which in turn are much needed when establishing a reserve. The other reserve is our Meadow Reserve at Banks near Southport; this is prime Barn Owl territory, and very quickly after setting up the reserve, we were rewarded by acrobatic scenes of families of barn owls hunting for voles on the reserve. An owl much in decline in the UK, it is very important that as much work as possible is done to enhance the habitat, to give them the best chance of survival. Our latest acquisition is the Watermeadow Reserve site at Wigton, which is opposite the Knoxwood site. This has previously been drained and farmed, but will now be returned to its former state where part of the field will be able to flood, and create that watermeadow site once more. There was historically a large sandy bank which sandmartins used to nest in each year - this will be reinstated and the birds encouraged to return once more. Already many wildflowers have been planted, and native berry and fruit trees planted within the hedging. This site is a wonderful 6.25 acres, and with a beck running the full length down one edge, it truly is a haven for all wildlife. We are now able to accept grant requests from established organisations with who work along similar lines to Three Owls in helping wild birds; in 2010 we distributed over £21,200 in grants, and £96,500 of equipment to help save wild birds lives. In 2011, further grants were made totalling over £15,000, each grant meaning that precious wild bird lives are being saved, protected and enhanced. Mrs Eileen J Watkinson MBE was truly one-of-a-kind. For the majority of people who came to see her - it was to bring a bird they had found needing help. She would always put the birds' need before her own, even when it was to her own detriment either financially or healthwise. She was instrumental in setting up the nature reserve at Rochdale, building on what she had learned whilst founding, establishing and developing the Sanctuary whilst based in Oldham. Where matters exceeded her knowledge, she was never afraid to ask for help, and as such the work of Three Owls has built up contacts and supporters worldwide over the years. All three of the current trustees worked on a one-to-one basis with her over the years, and they are all helping to ensure that the work she set up all those years ago continues in line with her wishes. It was her dream that one day we would be able to set up a woodland, and name it Three Owls Wood ..... this is the new woodland reserve we are setting up at Tarleton at present. Our Helpline, email and website ensures that the wealth of knowledge and information built up over the last fifty years, will continue to help people that find wild birds in distress. This information is freely given out not only to members of the public, but often to vets, other animal rescue sanctuaries, and even the emergency services. Calls come in from throughout the UK, and on occasion from other countries around the world. I had a very happy childhood. My father was a busy GP and also a specialist anaesthetist. I used to show his patients into the surgery and answer the telephone. When the hospital operation list was phoned through, I had to write down the details very clearly and learned to spell all sorts of ailments. My very early days were spent with Miss Kemp, a Scottish governess. She gave me and my brothers and sisters an interest in literary subjects which has never left me. I could not say that I really enjoyed school, but I did reasonably well and, as an 18-year old student, went to help in a kindergarten to see whether I wanted to be a teacher. I soon knew that I didn't, so the next course was a secretarial one which I never regretted as it helped me to run the many offices in which I have worked since. In the years before the Second World War I had been trained as a social worker and, throughout the bombing raids on Liverpool, worked in rest centres for those who had lost their homes. One of these centres was situated between the airport and an enormous gas holder! You can imagine what we felt like when the planes came – usually several times during the night. Another job I found myself saddled with was driving a vehicle with very hard seats from the centre of Liverpool to an outlying nursing home. With ten very pregnant ladies in the back, we had to negotiate the bumps and avoid the craters following a route along the dock road where, at some sections, there was not a building left standing and fires were still burning after the night raids. When the war ended I left Liverpool for Bradford, taking a position as the first personnel officer to be appointed to a textile mill. My experience of life widened considerably in this environment, for it was a downtown factory employing 500 people. It undertook most of the woollen textile processes, and was very noisy and damp and had what, by today's standards, would be regarded as extremely primitive welfare facilities. It was a very exciting job. I started without an office or even a chair, and finished with a department, an assistant and a first-aid room with a qualified nurse in charge. I married in 1946 and the following year left personnel management to start an industrial photography business with my husband. He was the driving force. My role, he used to say, was "to keep the promises he made to our clients". We trained young staff to work to his standards and, for nearly eighteen years, the business flourished. My husband wanted eventually to live in France and he travelled there a lot on photographic commissions. I seemed to be forever flying out to meet him at Cherbourg, Paris, Luxembourg or Brussels, or coming back from those places to keep the wheels of our business running smoothly. These were also what I call my "cricketing days", for we spent a lot of our limited free time in the company of Learie Constantine, the West Indian player. He had been the welfare officer in Liverpool for the folk who had come from the Caribbean to help our war effort. I listened and learned about cricket and it was a magical experience to see this strange game from such close quarters and through such knowledgeable eyes. I well remember - after a long speech by Learie - a Czech friend of ours, who hadn't a clue to the game – asking him in all seriousness "But tell me, Mr Constantine, why do you run?" One dark and stormy night in September when the wind howled around our Yorkshire flat, the doorbell rang. When my husband answered it, I heard the familiar voice of Learie. But his companion seemed a stranger. He was an enormous man and when he entered the sitting room he almost filled it. As he spoke, the "penny dropped". Who could fail to recognise the voice of Paul Robeson? Mr Robeson was in this country to address a meeting and Learie decided that they would call in on the way to their hotel. We talked until the small hours and it was wonderful to listen to that marvellous rich voice relating stories about his life in the United States. It's another memory that will remain with me always. Next came our "Theatre Days". We were associated with a well-known repertory company and we used to throw the most wonderful hot-pot suppers after the shows. We made many friends – some of them now household names. We would laugh and talk the nights away, but still arrived at work on time the following morning. We spent a great deal of time in Scotland photographing estates which had come onto the market and were bought by a friend of ours. The subsequent catalogues included prints which we produced in our darkroom. Hundreds and hundreds of them. I got very used to monotonous jobs! But it was all to end in 1964 when, after six years of slowly incapacitating illness, my husband died from an inoperable tumour of the brain. There was no way the business could continue without him and so it had to be wound up and our small staff found other work. One of my pleasantest memories took place shortly after my husband died. A good friend and client of ours lived in a Scottish property. In the deeds it transpired that if the monarch passed by the gates, the owner had to present her with a red rose. The Queen had an appointment which did, in fact, take her car past the property entrance. So our friend celebrated the event with a champagne party and we all gathered in the roadway to watch him hand the Queen his red rose – which she graciously accepted. My involvement with birds all started on a spring evening in 1962 when a little girl called Helen handed me an injured sparrow. I would have sent her away but she was so determined as she stood on my back doorstep that it was inevitable I'd agree to take the fledgling in. I now know that it was at that moment in time that a bird sanctuary was "hatched". By 1969 I had about 100 birds, because once it became known that I would take them, everyone brought them to my door. In 1967 the three owls had arrived from which the Sanctuary has derived its name. I was living in Oldham and there are three owls on the Oldham Coat of Arms. A friend, seeing my predicament and realising the "bird business" had become a serious matter for me, offered to purchase a property and loan it to me for the time I continued to care for birds. I don't think anyone imagined this would be for more than a few years. But those years have stretched to thirty and now, just outside Rochdale in the heart of industrial Lancashire, we provide a round-the-clock service each day of the year to anyone finding a bird in distress. We have developed a four and a half-acre Reserve from what was basically derelict land, with ponds and shrubs for the birds which can be released. The ones which cannot fly can wander freely in the grounds, coming back of their own accord for protection within the Sanctuary at night. And for those that need aviary accommodation, we have extensive and well-equipped enclosures. Our new hospital rooms – set up under a grant from the Universities Federation for Animal Welfare - are almost always full. New patients come and go. Some of course die – but the recovery rate is high. We aim so save life where we can and only if a bird is so badly injured that it cannot live in a reasonable condition, do we terminate its life. Surprisingly this is quite a rare occurrence. Our latest development is a reception room where new arrivals are assesses before moving to the best accommodation we can provide. In 1988 the owner of the property offered it to me at the wonderful price of £22,500 - a third of its value on the open market. We managed to raise the sum in four years and registered as a Charitable Trust. Hopefully this will help to ensure the Sanctuary's future. Now we are endeavouring to put the property into first class order and improve our facilities for the birds. I look around with a sense of pride. It fulfils a very real need in the local community and solves problems for many people. I treasure the contacts I have made over the years and the many good friendships which have grown up. In 1991 I was awarded the MBE for my work with birds. I did not feel physically able to cope with a visit to London, even though many friends offered me transport. In such circumstances the Lord Lieutenant of Manchester was requested by Her Majesty to present the medal, and this he did in the late summer of that year. We had a party which included many friends of Three Owls without whom I would never have been able to carry on the hard work done at the Sanctuary. It is a worrying thought that somewhere, someone must be found to raise the funds, cope with a busy office, work a seven-day week and frequently an eighteen-hour day. My experience of the jobs I did before this final one has equipped me to cope with stress, the long hours and the inevitable minor and sometimes major crises. We have formed a Charitable Trust and I must have faith that somehow the future will be safeguarded. That there is an enormous need for such an organisation as Three Owls is evidenced by the never-ending stream of casualties and enquiries. At least 1,000 new 'patients' a year. Although finance is always a problem, Three Owls has been kept going over the last quarter of a century by the support of people who bring birds, those coming to hear about the work from as far away as Australia and New Zealand, and those who visit to see what goes on and become supporters. Seven years ago I reared a young herring gull. It was abandoned by its mother, and as it has never been able to fly, she must have known something was wrong. It follows me everywhere. Its brother left when he was old enough to take off, but every now and then returns to visit us – sometimes after an interval of six months. It greets us as though it has never been away, takes a few fish we throw to it and then vanishes. It is incidents like this that make it all worth while. I like to think Three Owls is run in an efficient and professional manner with its first priority being the care and contentment of the birds. Visitors who come to look go away astonished that those which have to stay with us are unafraid and plainly regard this as their home. Mealtimes – 7am and 3pm – are very important and in the afternoons one can see birds flying, walking or hobbling from the Reserve for tea. We welcome visitors and, through a grant, have now opened the ground floor of our barn as a Visitors' Reception Centre where we can entertain people waiting to go round the Sanctuary. Always we keep on gathering new ideas to make conditions better for the birds and more interesting for those who bring them and come to see them. If we can raise the cash, any new idea can become reality. And where do I stand after all these years? I have a full-time occupation which is gradually becoming too hard for me, but which is extremely interesting and never boring. I want to see the Sanctuary in a position where it can continue without me, and the only way I can imagine this being achieved is by creating a very much larger income. We employ quite a few part-time people but they are restricted to the few hours on the few days they can work. We need two full-time assistants to whom we can pay a fair salary and hope to find folk willing to commit themselves to Three Owls, take the position seriously and cover for each other so that neither has to forego a reasonable social life. Lately I have been astonished to learn of the image I seem to have created in people's minds of the real ME. "Dedicated", they say. "Thinks of nothing but birds...exists only for the birds...spends every waking moment considering birds". The truth is that I do this job to the best of my ability – just as I tried to do all the previous jobs I've had. I worked just as hard during the Liverpool blitz and just as hard in our own business. There are many occasions when I would like to pack it in and go home – to partially retire. I'd like to give time to the study of difficult birds like the migratory ones. To read, entertain (not to talk about birds) and to travel once again to the France my husband and I loved and where we'd hoped to live. Perhaps to put down in book form the knowledge gained here at the Sanctuary over the years in the hope that it might encourage others. I feel neither "bitter" nor "twisted". It was a personal tragedy that brought me into this work. It has given me a very different life from the one I had before. It has created numerous friends and contacts everywhere. Here at Three Owls we try to find a solution of sorts to every problem put to us and this is a challenge we cannot forego. It is a unique establishment - well known over a wide area. And it has helped many birds and many people. In a small way this is an achievement, and I could rest content if I felt that its future, when I am gone, is assured.